Commonwealth Chimney Sweeps in Harrisburg, PA answers frequently asked questions about chimneys. 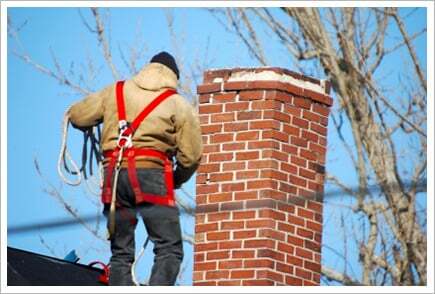 Chimneys must be cleaned and maintained by trained professionals. The experts at Commonwealth Chimney Sweeps in Harrisburg, PA have answered some of the FAQs about how to take care of them. Please take a look. Let us know if you are looking for an answer to a specific question which has not been answered below. Will cleaning my chimney get dust in my house? What does a chimney cleaning consist of? We clean the entire system from the firebox up, which includes the smoke shelf, smoke chamber, and flue. We then check for any visible problems. When you burn a cord of wood you should have your chimney checked or cleaned. Should I have my gas or oil fired chimney cleaned? Yes an oil furnace creates soot as a byproduct of combustion and a buildup of soot can cause deterioration that can cause a puff back throughout your home. A gas furnace or appliance can cause deterioration inside the chimney where debris can block the escape of deadly carbon monoxide. Why does a stove insert cost more? As the insert must be removed from the firebox to clean the system properly, they require the use of a lift or mechanical device to remove them. A normal cleaning can take anywhere from a half hour to an hour depending on the type of chimney and its construction. A flue is a passageway inside your chimney that vents the gasses and smoke out of your house. Chimneys can have several flues in them. You should have a separate flue for each appliance. that is each fireplace, stove and furnace or boiler. All chimneys should have caps to prevent leaves, sticks, debris, animals, birds and most importantly, rain and snow from entering the chimney flue. Water and snow entering the chimney can cause damage to the firebox and damper and general deterioration of the mortar and bricks. What if I have a question that wasn't covered? Please Email us. We will be glad to answer any of your questions.